BTN editor-in-chief Malcolm Ginsberg (and wife) in August took a cruise from Tilbury to Northern Norway and Russia. Murmansk, well beyond the Arctic Circle, was the second port of call in the former Soviet Union. Please read first 3 September ON TOUR. Never heard of Murmansk? Visit HMS Belfast in the Pool of London and you will learn all about it. It is the gateway to Russia directly from the North Atlantic and was where the Allies sent the convoys during WWII in support of the Soviets in their stand against the Nazis. HMS Belfast (built incidentally in Newcastle) played an important role in the support of these convoys and this is commemorated on board the ship. Murmansk is generally accepted as the world’s northernmost city. The 'midnight sun' is above the horizon from 22 May to 23 July (63 days), and the period with continuous darkness lasts a bit shorter, polar nights from 2 December to 10 January (40 days). July is the warmest month of the year with temperatures reaching 20°C, but they regularly plunge beneath -20°C in the winter and -40°C is not unknown. Due to the Gulf Stream the sea routes do not often freeze, it has the world's most northerly tram system and a rail link to Moscow. Our visit in late August found the sun out and the city looking bright. We were welcomed to Murmansk by a TV crew from the local early evening magazine programme. Elena Belkina was on the dockside keen to learn about the ship and the passengers and amazed to learn Marco Polo was once a liner in the Soviet merchant fleet as the Aleksandr Pushkin. A cameraman followed us around during our tour of the city. He was genuine. The city wants more cruise ships. There is certainly great potential. Murmansk has a population of around 300,000, is 1,149 miles from Moscow, 67 miles from the border with Norway and 113 miles from Finland. The (aging) Russian Northern Fleet is based at the port including the aircraft carrier Admiral Kuznetsov which only goes to sea escorted by a tug, and the so-called battlecruiser Pyotr Velikiy, a 1980s throwback from WWII with missile launchers where the guns would have been previously fitted. A museum covers the history of the Russian navy with all manner of artefacts, and is housed in a turquoise coloured building fronted by anchors. Sad to say not many cruise ships visit Murmansk currently due to Russian visa obstructions. Organised groups are allowed off the ship, and whilst the 72-hour rule for individuals seeking to see for themselves, and introduced for the FIFA world cup, is still rumoured to be operating it proved impossible to find out how it works. The London Embassy could not help. 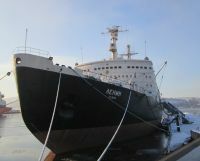 In any event Marco Polo berthed at a commercial dock without any facilities some way from what is the normal cruise pier close by the icebreaker Lenin. The Lenin is both the world’s first nuclear-powered surface ship and the first nuclear-powered civilian vessel. After three decades of service, she was decommissioned in 1989 and today is a museum. It is a showpiece and on board we saw much of the original equipment, including its two now-inert nuclear reactors. A one-hour guided visit offered an intriguing look at the construction and service of a ship built to literally ‘crack the ice’ paving the way for a small fleet of 21st century icebreakers keeping the sea routes open. Sitting high up on the outskirts of the city and overlooking the main waterway, known as Kola Bay, is the Lighthouse Monument which commemorates lost sailors. 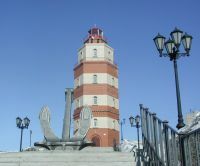 Nearby is the memorial to the 118 crew members of the Kursk submarine which sank in the Barents Sea in 2000. One and half sea days followed. The small fishing port of Sortland, the Blue City, makes a great effort to welcome cruise ships and produces a programme of things to do and see, with a number of places to visit especially open for our Sunday call. Sad to say with Russian protocol giving a late departure from Murmansk and heavy seas slowing Marco Polo our arrival was late causing the programme to be curtailed. Those that went on a coach excursion came back enthusiastic from a trip that included some dramatic countryside and narrow roads. 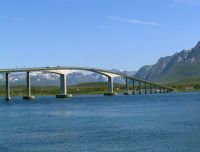 If you are looking for Sortland on a map it is tucked away as part of the Lofoten Islands at the man-made end of a fiord, a distinctive concrete bridge stopping the passage of Marco Polo. It is south of Tromsø in an area called Vesterålen. It offers distinctive scenery with a dramatic mountain background, plus sheltered bays and beaches. Sortland is on an island connected to the Norwegian mainland by a series of bridges and tunnels. The centre is a short walk from the pier with a small modern indoor shopping mall and a separate community centre. It gets cold in the winter and we were impressed with the heated hand rails on the escalators in the supermarket. The inspiration for The Blue City came from Bjørn Elvenes, a local artist, whose concept led to the formation of a private steering committee in 1998. Elvenes had chosen blue as a symbol of Sortland's maritime and fishing heritage. His idea was to paint all 17 blocks of the inner city in various shades of blue, with judicious use of contrasting colours to create a distinct identity and three-dimensional presence for each building within an overall design motif. The first buildings, mainly storehouses along the waterfront, were painted in summer of 1999, and the project continues. Some of the more hardy Marco Polo clients made their way to Munningsletta, an open space taken over for the day by local folk for what was a traditional village fair and cultural event. Coffee, tea and homemade cakes made a change from what was on offer on board the ship. The local airport is called Skagen (Stokmarknes – SKN) with twice daily Widerøe flights to Tromsø and a seasonal service to Oslo. Bergen is a popular port of call for cruise ships on their way to and from the Norwegian fiords. It is Norway’s second largest city, after Oslo, and was once part of the German inspired Hanseatic Trading League. 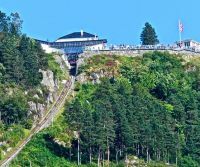 It features colourful wooden houses and one of the world’s great city centre dramatic rides, the Mount Florien Funicular, a five-minute journey to the top and a spectacular view of the whole municipality. There is a restaurant adjacent to the station. The Funicular is just a few minutes' uphill walk from Torget Square and the open-air fish market (and tourist information centre) at the very centre of the city. This year it was 100 years old, the pair of original 65-passenger trains long replaced with ones that can carry 100 souls. Impressive was the way that wheelchair bound visitors were loaded into a special area. Don’t be put off by the queue. It quickly moves. Around one million visitors are hosted every year. Edvard Grieg, the composer (he of the piano concerto that Eric Morecambe could not play in the right order) was born and died in Bergen. His home is called Troldhaugen and now is a museum and his and his wife's last resting place. Grieghallen, a 1,500-seat concert hall was named in his honour. The building was designed in modernist architecture style by the Danish architect Knud Munk. Grieg knew, and was respected by many of the great composers of the late 19th century including Franz Liszt and Pyotr Ilyich Tchaikovsky. Greig, a Unitarian, cancelled all his concerts in France in 1899 due to the Dreyfus Affair. He suffered hate mail in France as a consequence. On offer was a Segway Tour taking visitors around some of the most interesting Bergen sites including the Bergen Aquarium considered to be the largest and most modern aquarium in Northern Europe. We took an open top bus tour and were able to see perhaps a little more than our friends, mastering the self-balancing battery-powered single operative units. The colourful Hanseatic wharf in Bryggen was the heart of medieval Bergen and although it suffered from fires the remaining high gabled buildings are still in use. The area is listed by UNESCO as one of the world’s most significant examples of the history and culture of a medieval settlement. It is a fascinating honeycomb of active workshops, where one can observe painters, weavers and craftsmen at work. Also here, in one of the oldest and best preserved wooden buildings, is the Hanseatic Museum, furnished in the style of the 1700s to give an intimate picture of the life and times of a Hanseatic merchant. All close together, near the main cruise terminal was the Rosenkrantz Tower, dating from the 13th century, destroyed in WWII but now rebuilt. It has a colourful history and sits close by King Hakons Hall, once a royal residence when Bergen was the capital of Norway. On a cruise one only gets a brief taste of a city. Sometimes the visit is such that there was not enough time to explore properly with a need to come back. Bergen is on the list. And a final sea day before docking at 08:00 in Tilbury. Getting off was as easy as getting on. We really liked Marco Polo. A 17-night absorbing trip. Please see also the October Cruise Review.